Written Inc.: Are you a defender of the status quo? I don't know who originally wrote this passage, but I knew as soon as I walked into an office and saw this hanging on the wall that I needed to capture and remember it in some way. See, the office where I found it was a corporate lab, an attempt by a company many of you likely already know to break the mold of legacy and come up with fresh, new ways to think and act. The company, a large financial services org, recognized the only way to accomplish this was to set up something completely separate from the mothership, in the region's leading tech incubator, and to set its people loose. I spoke with the lab's leader for the better part of an hour, and came away inspired in ways I'm still having difficulty putting into words. He gets it, and he's surrounded by people who get it, as well. The world is, apparently, in very good hands when folks like him are leading the way. 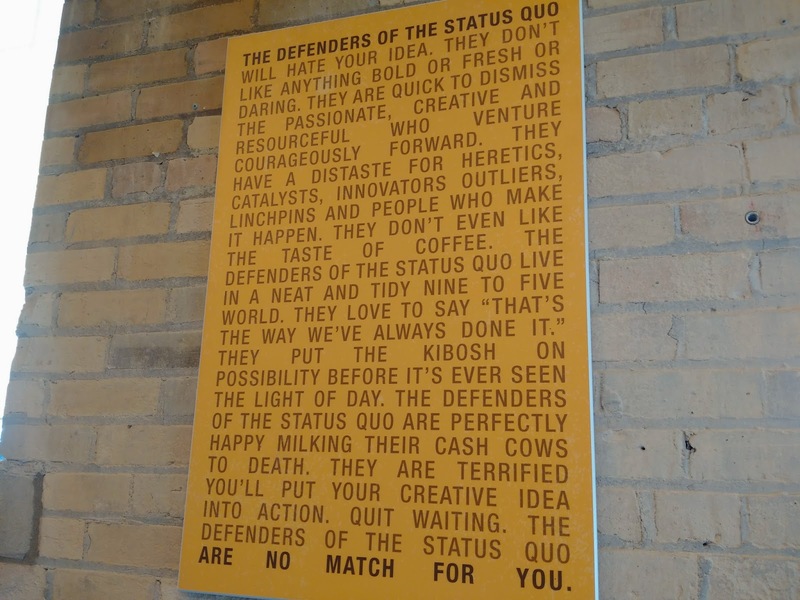 "The defenders of the status quo will hate your idea. They don't like anything bold or fresh or daring. They are quick to dismiss the passionate, creative and resourceful who venture courageously forward. They have a distaste for heretics, catalysts, innovators, outliers, linchpins and people who make it happen. They don't even like the taste of coffee. The defenders of the status quo live in a neat and tidy nine to five world. They love to say "That's the way we've always done it." They put the kibosh on possibility before it's ever seen the light of day. The defenders of the status quo are perfectly happy milking their cash cows to death. They are terrified you'll put your creative idea into action. Quit waiting The defenders of the status quo are no match for you." I haven't visited for a long time. After reading this post, I can't imagine why I haven't made the time regularly. You always make me think and/or inspire me. Thank you. About this specific post, I couldn't help but recall my unhappy 7 years working in a large department of county government. Change was absolutely the enemy. The major part of the reason I had to leave, despite the good salary & great benefits.